If you haven’t had the chance to take in a Lugnuts game, you are missing out! 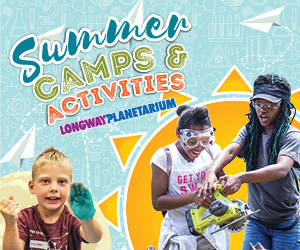 With great promotions, affordable tickets and plenty of family fun around Lansing, this is always a summer must for us. 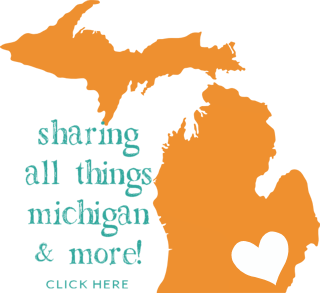 While the sunshine is still a few months away here in Michigan, if you’re starting to think ahead, this list of promotional events can certainly aid in planning. The season kicks off on Saturday, April 7th. Note: Not all are kid-friendly, so consider some of these for a friends night out, too. I’m soooo intrigued by the Stranger Things night with all things Eggo 😉 So fun! Check out all the other fantastic events in store below and click here to print a PDF with all the dates! Join us in honoring former Michigan State punter, Mike Sadler, with a night dedicated in his memory. The first 1,000 fans will receive a Michigan State-Green Lugnut #3 jersey. Hey Diddle Diddle, a craft beer dedicated to Mike, will be available for sale courtesy of Atwater Brewery. Proceeds from the game will go to the Sadler Foundation. Salute to Backyard baseball and the G.O.A.T himself: Pablo Sanchez. Come celebrate the iconic 1997 video game on Pablo Sanchez’s 21st birthday: August 18th, 2018. First 1,000 fans will receive a Pablo Sanchez Lugnuts bobblehead. Baseball is coming to Cooley Law School Stadium on May 19th, 2018. Join fellow fans in celebrating Game of Thrones Night. Sit on the throne, enjoy wine tastings, food specials and more! The first 1,000 fans get a custom Noah Syndergaard Game of Thrones bobblehead! 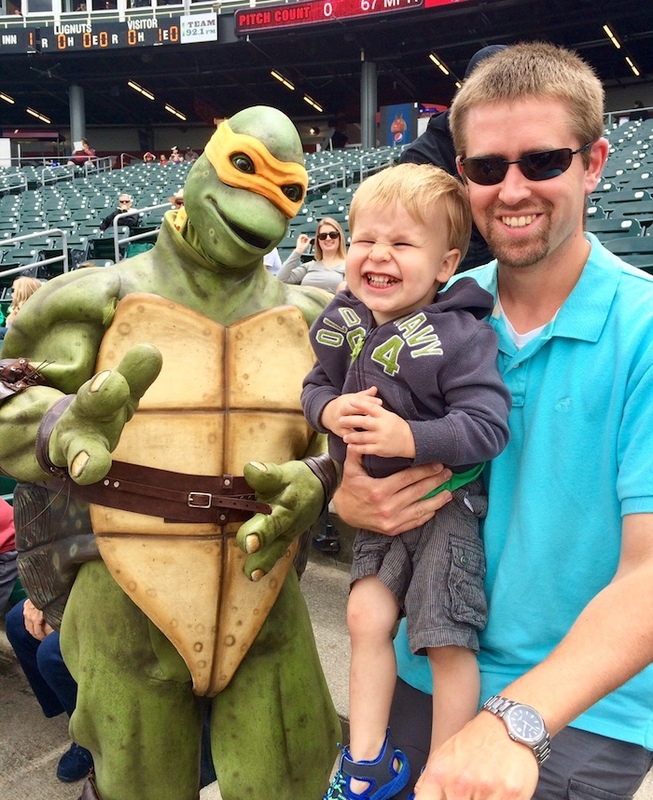 The magic is back at Cooley Law School Stadium on June 23rd! Join Harry, Ron and Hermione as the stadium is transformed in Hogwarts School of Witchcraft and Wizardry. 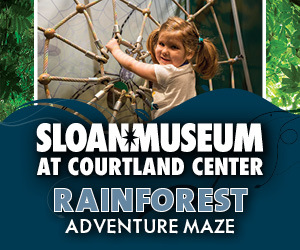 Enjoy Butterbeer, Quidditch, photo-ops, trivia, sorting, House Cup challenge and more! PLUS, a SECRET giveaway to the first 1,000 fans! Opening Day is April 7th 2018! Celebrate the start of the Lugnuts’ 2018 All-Star Summer with a pre-game Block Party on Michigan Avenue with games, food & drink and live music! 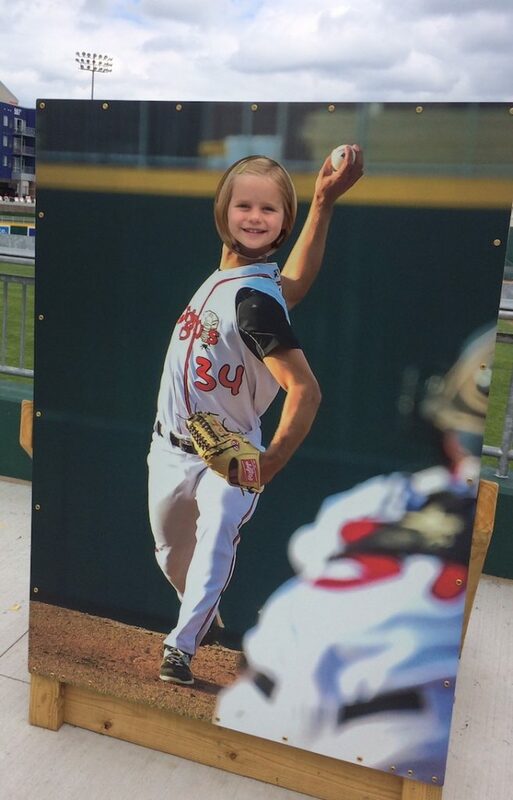 Meet the team and get autographs from your favorite Lugnuts players! First 1,000 fans will receive a scarf courtesy of Auto-Owners Insurance and stay after the game for 2018’s first LAFCU Fireworks Spectacular! 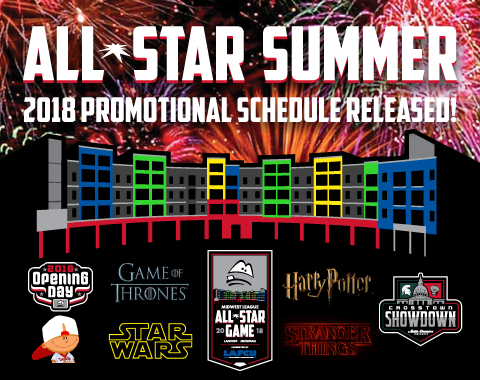 The Lansing Lugnuts will be hosting the 54th annual Midwest League All-Star Game presented by LAFCU on Tuesday, June 19th, 2018! Meet the best baseball players in the league with a picture and autograph session! Giveaway to first 1,000 fans courtesy of LAFCU! Catch a homerun during the pre-game homerun derby before the West battles the East in an All-Star showdown! Stay after the game for the biggest LAFCU Fireworks show of the year! Be on the lookout for special guest appearances and entertainment throughout the game! Enjoy Keystone specials all game long! First 1,000 fans get a Lugnuts “Lug Life” bro-tank. All are welcome to celebrate Pride Night at Cooley Law School Stadium! Singles: Download your favorite dating app, set your radius to surround the stadium and swipe to your heart’s delight! There will be a special area to mingle and socialize, as well as prizes awarded to fans who match with Big Lug! Enter the Upside Down on July 21st. Meet your favorite characters from Stranger Things, enjoy featured Eggo drinks and food specials! In addition to $1 Hot Dogs, Fountain Drinks and Ice Cream Sandwiches, we are also adding $1 Popcorn and 12oz Miller High Life to the Dollar Deal Day menu! In addition to $2 beers and half-off crafts, we are also adding $2 wine to the selection! Mondays – Dog Days of Summer: Bring your dog to the ballpark every Monday! Tuesdays – Dollar Deal Day: $1 hotdogs, Miller High Life 12oz can, Soda, Popcorn & Ice cream Sandwiches! 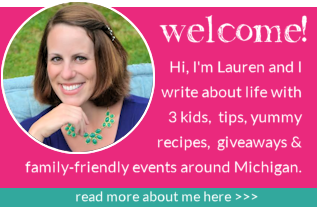 Wednesdays – Winning Wednesdays: If the Lugnuts win, raincheck your ticket! Thursdays – Labatt Thirsty Thursdays: $2 Beer & Wine, Half-Off Crafts! 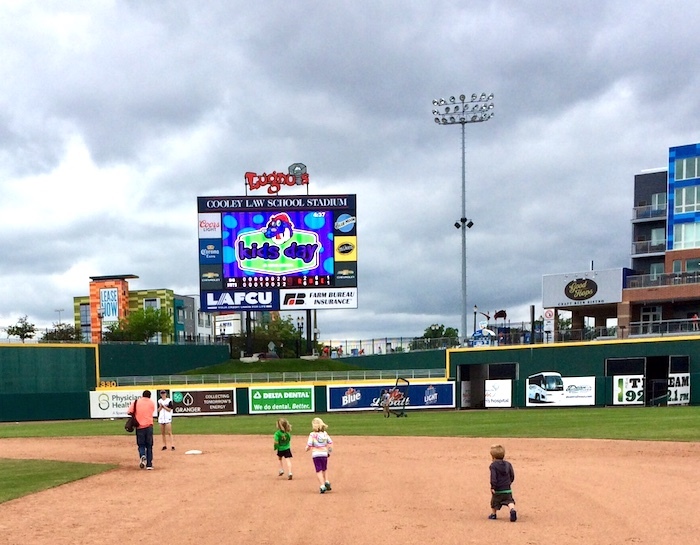 Sundays – Delta Dental’s Kids Day: Kids run the bases / play catch / player autographs! What is your favorite promotion night to attend? Thank you for sharing, calendar marked!